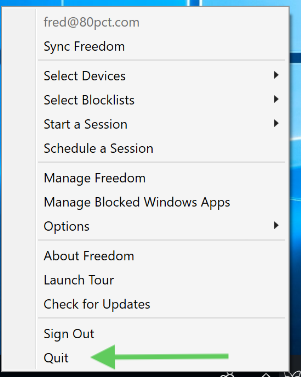 This article provides information on how to stop or delete an active Freedom block session. 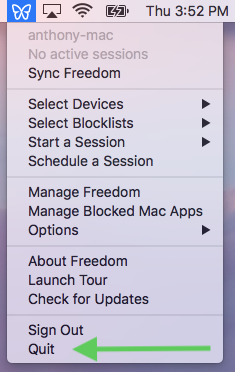 If you find yourself in a Freedom block that you would like to stop, click on the Freedom icon (butterfly) on the Mac or Windows client and select 'quit'. If you would like to disable the ability to quit Freedom in the middle of a session, you may do so by clicking on the Freedom icon, going to ' options', and selecting 'disable quit during session'. Please note that if you decide to quit in the middle of a session, the next time you log back in, the session will continue from where it left off. You can also delete your device directly from the Freedom interface. To remove delete your device from Freedom, click on the device in the device list, then select 'delete'. This will remove the blocks on these devices. Again, this will only work when running Freedom in unlocked mode. Finally, you have the option of contacting us at support! We can delete blocks manually for you, but please note there might a small delay. To have us delete a block for you, just email us at support@freedom.to or chat with us from the green chat bubble in the bottom right corner on our website and we'll try to respond as quickly as possible.